An inquest into Piltdown Man doesn't seem to offer much cheer to those of us who think that science is a legitimate enterprise that has drawn a credible chart of human evolution. Anyone conversant with the Piltdown history will readily, if not eagerly, agree that many of the researchers shaped reality to their heart's desire, protecting their theories, their careers, their reputations, all of which they lugged into the pit with them. As for the historians' search for the hoaxer, all the suspects were long dead before the assessments of their culpability began. Setting aside the Roman courtesy de mortuis nil nisi bonum hasn't harmed any of them. Their relatives, friends, and admirers may have been embarrassed into shame or stroked into resentment, but that seems a small price to pay for all the fun. Less fun is the more important part: what the Piltdown case signifies. It is hard to know which particular mistakes we should pluck out of the cornucopia of error as examples of what went wrong. Dawson had a personal investment in enhancing his wizardry and, among other follies, invented ravenous bacteria to scavenge out a pulp cavity; Woodward stitched a human condyle onto an ape's jaw; Keith and Smith tumbled into a macho confrontation over who was the better reconstructionist of crania; Abbott fell in love. The fundamentalists generalize from Piltdown Man to the entire study of human evolution. McCann wrote in 1922: "The Piltdown remains disclose the ease with which 'missing links' between apes and men can be fabricated by resort to wide stretches of the imagination in support of pre-conceived theories." In 1967, the Watchtower's Did Man Get Here by  Evolution or Creation? shoved Piltdown Man forward as Exhibit A of the way evolutionists manufacture facts. In 1979, Duane Gish, of the Institute for Creation Research, likewise wrote of Piltdown Man: "The success of this monumental hoax served to demonstrate that scientists, just like everyone else, are very prone to find what they are looking for." You can hardly blame the fundamentalist philosophers for occasionally whipping Piltdown Man, the bad boy of evolutionary theory. Heidelberg Man Built from a jaw bone that was conceded by many to be quite human. Peking Man 500,000 years old. All evidence has disappeared. over 50 years ago is that of an old man who suffered from arthritis. region just north of Australia. physique and brain capacity to modern man, so what's the difference? Modern Man This genus thinks we came from a monkey. The historians Broad and Wade support the view that scientists not only make mistakes but deliberately commit fraud, and not just now and then. Their Betrayers of the Truth (1982) divined that scandalous fudging is epidemic in science. They investigated thirty-four betrayals since the  Renaissance, such as Newton's tailoring data to suit his theories on optics, Mendel's making up statistics to prove particulate inheritance, and Piltdown Man. Thirty-four cases doesn't sound like a warehouse, but the authors calculated that, behind every one that becomes public, 100,000 others, major and minor, "lie concealed in the marshy waters of the scientific literature." That means that the waters of the marsh are clogged with 3,400,000 scientific frauds, 100,000 of which are of the Piltdown tribe. Philosophers whose premise has it that science is irrational also give aid and comfort to fundamentalists. Karl Popper (1934) rejected science as a system that can attain truth or even probability. Science, argued Thomas Kuhn (1962), is dominated by theory. A given theory, or paradigm, acts like a magnet, orienting data into the direction it wants. The paradigm is discarded not because it is found to be untrue but because it grows too cumbersome, or tiresome, or homely. Science is not incremental; it doesn't bring us any closer to any "true account of nature." Paul Feyerabend (1975) went beyond Kuhn as Kuhn went beyond Popper, as though in a contest to see who could be most corrosive. "Science knows no 'bare facts' at all," he declared. Scientists are dogmatic, and their method is "putrid." Once in a while, the ideas of philosophical irrationalists drift down to flavor the rhetoric of philosophical fundamentalists. Henry Morris, director of the Institute for Creation Research and an incorrigible exponent of creationism, wrote, "The proper term is not 'scientific theory' or even scientific hypothesis, but 'scientific model' or 'paradigm' or some such title" (Morris, 1981). The paradigm that our ancestors had a large brain and an ape's snout directed Edwardian researchers to find specimens with a large brain and an ape's snout. Today's paleontological paradigm directs researchers to find fossil anthropoids with a small brain and a human jaw. And they're found. The anti-evolutionist Francis Vere wondered whether, forty years from now, opinion will reverse itself and Piltdown Man will once again be high on the tree. The evolutionist Earnest Hooton also wondered if that could happen. The resolution of the question whether science does map the truth of reality or whether it is just another myth has consequences for us in our daily lives. In the 1920s, fundamentalists wanted to outlaw the teaching of evolution in public schools; today, they want to give creationism equal time with evolution, which change in attitude itself testifies to a sort of evolution toward tolerance or smarter strategy. They appeal to the Bill of Rights guarantee of religious freedom and to a sense of fair play. For their two-model program, they can find support in Popper: science isn't objective; in Kuhn: science isn't incremental; and especially in Feyerabend, who warned that the scientists want to take over and not give a chance to those who hold other ideas (such as the ideas that people can levitate and change into wolves). Though an epistemological anarchist whose heart belongs to Dada, Feyerabend nevertheless pled for state intervention. "Ye must stop the scientists from taking over education and from teaching as 'fact' and as 'the one true method' whatever the myth of the day happens to be." In that, he touches on a political program which, though frivolous in prose (the Dadaist is "utterly unimpressed by any serious attitude"), is potentially dangerous. For close to forty years, Eoanthropus dawsoni, a.k.a. Piltdown Man, was taught as fact. His australopithecine and pithecanthropine relatives are still taught as fact. If they are really as mythical as he was, then it seems the just thing to do would be to give equal time to competing facts or myths. If science is nothing more than myth, then biblical stories are agreeable alternatives and render, serendipitously, more wholesome ethics. The exposé incited criticism of evolutionary science. Earnest Hooton feared that its revelation of "calculated dishonesty" would have unpleasant consequences for biological science, heating up latent hostility to the theory of human evolution. "Already the press is flooded with accusations by anti-evolutionists that all the other evidence of man's origin from an ape-like ancestor has been deliberately faked by unscrupulous scientists" (Hooton, 1954). He pushed the Piltdown case aside as unique; but the creationists pulled it back as typical of what evolutionists always do, deceiving themselves and others, by turning apes into people. But, quite to the contrary, the Piltdown inquest can be seen as validating science in general and evolutionary science in particular. First of all, to go on the attack, it is possible that those advising us to beware of fudge are themselves in the concoction business. I don't know where Broad and Wade got the multiple of 100,000 submerged hoaxes for every known one, perhaps from the same well Parker dipped into for his 500 doctoral dissertations. Broad and Wade's accepting Harrison Matthews's conspiracy fiction does not advance one's confidence in the good sense of those savants of fraud. 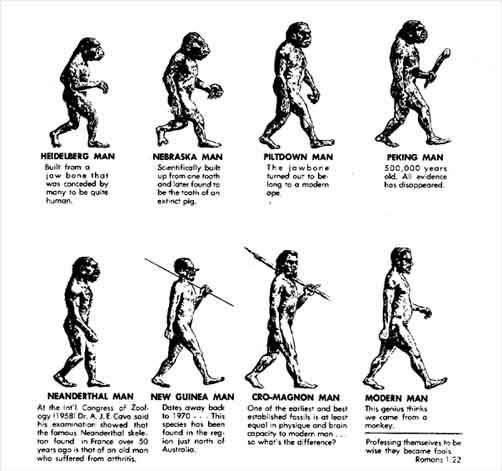 Gertrude Himmelfarb, in The Darwinian Revolution (1959), wrote that Piltdown Man was a disaster for evolutionary theory because so many scientists either welcomed it or rationalized it into harmony with their prejudices. However earnestly scientists may now dissociate themselves and their theory from Piltdown man, they cannot entirely wipe out the memory of forty years of labour expended on a deliberate and not particularly subtle fraud. Now that he has been kicked out of the family, evolutionary theory is left without "the much desired link, and even without such antiquity as Piltdown offered." Actually, the present inventory of links (or twigs) stores thousands of prehistoric hominid specimens, from frontal bones down to footprints. Her conviction that whatever is there lacks antiquity is incorrect: australopithecines lived long before Lewis Abbott's Pliocene Man. Suffering from an insatiable hunger for myth, fundamentalists concoct stories in comparison to which Piltdown Man emerges as solid reality. An apeman who trod the weald is a being more believable, really more imaginable, than, say, a spare rib that became a woman, a prophet who inhabited a whale, a virgin impregnated by a ghost. The hundreds of biblical stories fundamentalists serve up as literal truth are no less childish because they are familiar. These stories have generated a literature far vaster than the Piltdown bibliography; and an influence often unhealthy in the history of militant Christendom. Fundamentalists sift Mount Ararat for splinters of Noah's ark, they penetrate deepest Africa in the hope of sighting the brontosaurian Mokele Mbembe grazing by the shores of Lake Tele, and they smile and smile as they cordially invite others to join them in a giddy flight from rationality. Le Gros Clark perceptively advised that the facts known at that time achieved an integrity: "All the lines of collateral evidence appeared to be mutually confirmatory"-the geological proof that the terrace was Pleistocene, the index fossils, the fact that simian and human characteristics had been found conjoined in other hominids. Evidence convinced. Conviction and even conversion were based at least as much upon that awful four-letter word 'fact as upon cultural bias, paradigms, deep inner longings, and rhetoric. Keith initially could not accept a human mandibular fossa hinging with an ape's condyle; but then the canine was found; it was real; and he capitulated. Osborn was pummeled into agreement by the reinforcements brought from Site II. But many were convinced by their study that Piltdown Man was unreal. the forcible and persistent plea which the author makes for the consideration of evidence on its merits, with a mind untrammeled by tradition and unclouded by pre-conceived ideas. It is a plea well worth making, for a narrow dogmatism is not in these latter days the peculiar prerogative of the theologians. After the exposé, Hooton managed to say, while eating crow, that the great lesson of the Piltdown case is this: It's wrong to fix on scientific discoveries as irrevocable. Certitude is out of place in the empirical statement. Others have been similarly enheartened by the case. Earnest Hooton was proud of the detectives, who did "honor to science by their fearlessness and their candor; they reflect credit upon anthropology by their skill and thoroughness." H. V. Vallois, a paleontologist who had been skeptical about Eoanthropus, was glad that the hoax had stimulated the development of new techniques. The two surviving members of the Piltdown episode also affirmed the usefulness of the exposé. We have already seen what Teilhard thought about it-investigation of the find led to refinement of technology. The tests will continue to be important in dating and establishing unity or disunity of fossil assemblages. Keith, upon being told of the exposé, responded that his labor had not been wasted nor had the story of human evolution been damaged. The discarding of Piltdown Man made that story simpler (London Times, January 9, 1955). The tenacity of Piltdown Man for forty years shows-no surprise here-that the science of human evolution was imperfect. Yet no scientist in 1913 would have mistaken a labyrinthrodont skeleton for that of a drowned lecher and none in 1953 would have been conned by a new Piltdown Man. The science of human evolution is still imperfect, but getting better all the time, which is more than we can say about a lot of things. The entire case is something to cheer us up after all, after all the swiping today at evolution, at science, at rationality. The excavating I did at the gravesite of the Piltdown pit recovered an eolith, which now squats on a shelf next to a cast of the Piltdown skull. Although I have never sifted through gravel to exhume fossils, 1 have sifted through archives to exhume footnotes and have felt an excitement like that the diggers felt as they came upon one treasure after another. I have enjoyed putting textual relics together to recreate the history of Piltdown Man and to identify a hoaxer rather than a hominid, though the reconstruction may be a creature as fanciful as that unlamented monster, Eoanthropus dawsoni. What impresses me most is not the mistakes everybody made all over the place about fossils and culprits, but the way these people we have met, the defenders of Piltdown Man and the opponents, were dedicated to an intellectual idea: charting the course of human evolution. In defining where we came from, they illuminated where we are now.